Wii remote, did you try it? The Wii Remote feels natural in your hand. The two AA batteries sit in the bottom half of the controller and lower the remote's center of gravity, which is great for balance since you primarily only hold the bottom half of the controller. The top face of the Wii Remote has a slick plastic surface, while the underside has a textured matte finish, which seemed to help prevent the controller from getting sticky during long play sessions. The remote comes with a wrist strap designed to keep the controller from flying away in case you accidentally lose your grip while playing games. It's a good idea to set up your Wii in a large room since each player will need a decent amount of space to swing the remote around. 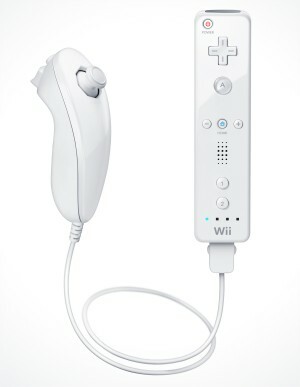 The Nunchuk attachment plugs into the bottom of the Wii Remote and functions as a secondary controller for your off hand. It has an analog thumbstick and two buttons. The Nunchuk also has a motion sensor--you can shake the Nunchuk while fishing in Zelda to move the lure and attract fish. You can calibrate the Wii Remote sensitivity and sensor-bar position in the Wii settings menu. We found that the remotes worked equally well on large screens and small screens. The Wii Remotes also worked on a variety of display types here in the office, including CRTs, LCDs, and even a rear-projection television. I really loved but my x360 have more graphics and interesting games!! aahhahaha...why play with a remote control, if you can play with a normal game control??? WiiMote its a nice idea...nice idea to break TV and glasses. my friend bought one and i was playing redsteel...it definetly requires some learning but its fun.